Astronomers have spotted likely comets around six faraway stars, bringing the total number of systems now thought to host the so-called "exocomets" to 10. It's likely that all 10 of these systems also harbor alien planets, suggesting that comets and exoplanets are often found together, as they are in our own solar system, the new study found. The number of exocomet-hosting systems could thus number in the billions across the Milky Way, as astronomers think our galaxy harbors at least 100 billion alien planets. "We see dust disks — presumably the primordial planet-forming material — around a whole load of stars, and we see planets, but we don't see much of the stuff in between: the asteroid-like planetesimals and the comets," Welsh added. "Now, I think we have nailed it. These exocomets are more common and easier to detect than people previously thought." Welsh presented the findings today (Jan. 7) duing a meeting of the American Astronomical Society in Long Beach, Calif. The researchers discovered the six new exocomet systems using the 2.1-meter telescope of the McDonald Observatory in Texas. The telescope picked up faint absorption lines that varied from night to night. The astronomers determined these features were caused by large clouds of gas emanating from comets as they drew close to their host stars and heated up. In our own solar system, comets usually stay far from the sun, only venturing close after a gravitational disturbance sends them veering off on a new course. It's likely that alien planets caused the newly discovered exocomets to plunge toward their stars, Welsh said. The newfound exocomets all orbit very young and bright stars that are about 5 million years old, because the team's detection technique works best with such stars. But higher-resolution instruments may reveal comets around older, more sun-like stars — the type around which most exoplanets have been found to date, researchers said. The first exocomet system was discovered in 1987, and three more were spotted over the years. "But then, people just lost interest. 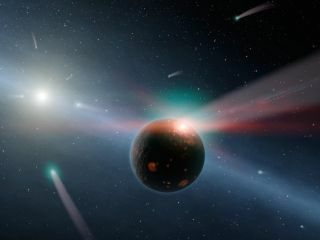 They decided that exocomets were a done deal, and everybody switched to the more exciting thing, exoplanets," Welsh said. "But I came back to it last year and thought, 'Four exocomets is not all that many compared to the couple of thousand exoplanets known — perhaps I can improve on that.'"